Mac version 350 available, too. 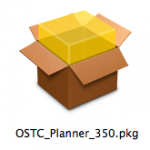 The OSTC-Planner version 350 for Mac is also available here. The new package installer should provide easier installation, as it meets the Mac standards. I currently don’t have automatic push of new versions to installed users, so you have to upgrade manually, which is just a few click. Previous Post:New PC version 350.